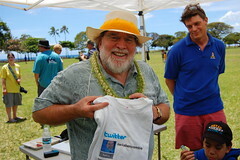 Island geeks are crazy for Twitter. 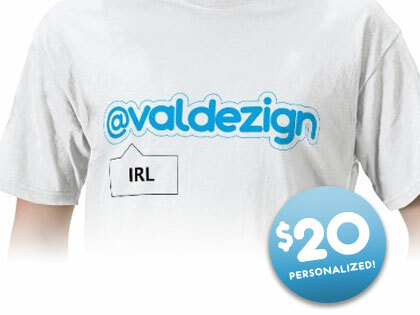 And now Hawaii designer Valentino Valdez of VALDEZign has unveiled (unofficial) Personalized Twitter Shirts. Valdez is using the custom T-shirt printing service Zazzle to print and ship the shirts, but will apparently be designing each shirt on demand as orders come in. The design is strikingly simple. Your Twitter username is printed in a cyan-colored, rounded sans-serif font that clearly evokes the Twitter logo (but hopefully skirts any trademark issues). And a Twitter-esque dialog box below reads “IRL” — or, “In Real Life” in geek speak. The shirts cost $25, including shipping, and are a perfect Christmas gift for the Twitter-addicted geek in your life. Order online now! And Twitter does offer Twitter T-shirts via Reactee. But the design is more Reactee than Twitter, hence emphasizing interactivity via SMS. Want to celebrate the downside of Twitter’s popularity? Check out Hello Fail Whale. I will definitely be purchasing a personalized shirt. Thanks Ryan for the post! Really appreciate the support!